A top member of Liberty University’s board of directors is expressing concern over university President Jerry Falwell’s endorsement of Donald Trump, stating that Trump’s behavior does not comport with that of a Christian. 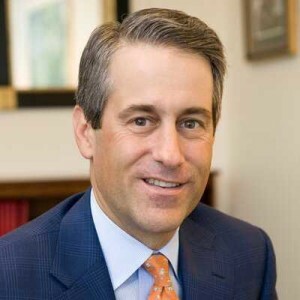 Mark DeMoss, the founder of the Atlanta-based public relations firm DeMoss, serves as the chairman of Liberty University’s executive committee. In speaking with the Washington Post this week, DeMoss stated that Falwell’s endorsement of Trump is a “mistake” as the Republican presidential candidate’s life runs contrary to the values of the school, which heralds itself as the world’s largest Christian university. “I’ve been concerned for Liberty University for a couple of months now, and I’ve held my tongue,” DeMoss said. He especially took issue with Trump’s ongoing practice of name-calling and trash-talking those who stand in his way. DeMoss said that he was concerned that Falwell compared Trump to his father, the late Jerry Falwell, Sr. He said that he wished to go public about the matter in order to be a voice for others at Liberty who are concerned about Falwell’s endorsement. DeMoss noted that a former alumni recently mailed back his diploma with a letter over the issue. Other members of the board include Billy Graham’s grandson, Will Graham, and Jonathan Falwell, who leads Thomas Road Baptist Church. Jerry Falwell, Jr. told the Washington Post that he was “disappointed” in DeMoss’ statements, which he said he found to be “puzzling.” He said that his endorsement of Trump was not meant to influence others at the university. Liberty staff posted clarification on social media following Falwell’s endorsement, noting that his support for Trump was only his personal view and did not represent Liberty University. He noted that DeMoss had supported Mitt Romney, a Mormon, during the 2012 presidential election, and helped to bring Romney to Liberty University to speak during a commencement service. As previously reported, Falwell has stated that he does not believe a candidate must be a Christian to be electable, but has repeatedly defended Trump as being a Christian. However, some disagree, stating that the thrice-married, profanity-laden candidate does not bear the fruit of a Christian, and that generosity alone is not the defining mark of being born again.